Am I mistaken or is the cam brg lube hole facing the wrong way also. Is'nt is supposed to be facing the piston side of the block as well as beimg upside down? I haven't been inside one of these engines before so correct me if I'm wrong. I don't think the bed has carried much more than a sign board, couple of lawn chairs and a cooler. "Working" truck ?, maybe. I got a chance to see it and hear it in person last June. Works for me! Why not do an in tank EFI pump conversion that comes with it's own sump? I assume there are. The main thing is to measure from it's corresponding hole, point, bracket, crossmember, whatever on the opposite frame member. Basically measuring diagonals. It's going to be pretty hard to get accurate measurements with everything still in and ,on the frame. My suggestion would be using a plumbbob and marking identical drop points on the shop floor, moving the truck and measuring those marked spots. I'd suggest using the ends of the frame, a point where the front of the rear springs are hung and a point where the rea of the front springs are hung. Measuring between sections will help you locate where the frame is bent if your overall diagonals don't match. Using a chalk line from drop point to drop point may also help you visualize it. If diagonals don't match, find a square section, probably the one the rear suspension is in, try to establish a center line front to rear in that section and then extend that line the entire length of the frame. That will show you how much the frame has to move to get it square. I run a 8000# license on my truck here in WI, cost is $105 annual. There are 2 weight divisions below mine and they pay less,. I think the lowest is 75. My old tiltbed was licensed at 28,000 and I think I paid 250 per quarter as a private hauler 10 plus years ago, commercial license was much more. Before beating on the headers, take another look at the set screws. Most set screws on steering shafts are set into the shaft vis a drilled pocket so it can't slide or move. If you haven't done that, try that first or if you have, try drilling it a bit further so the set screw is no longer proud of the locknut. I believe there were shallow and deep pans. Your article says 9 and would be typically for a shallow pan if the pic in the article is any indication. Deep pans or an aftermarket deep pan are going to take more. Did the pickup have an extension to drop it to the bottom of the pan? If you smoked the trans, you should be able to see and smell it in the fluid. You did remember to install the converter bolts, right? Easy enough to forget to put them in when putting big pieces together and thinking I'll remember to do that later. Fluid level has to be checked with trans in neutral on the 727 since the converter returns some to sump when in park, giving a false level of full. Recheck your band adjustment as well. 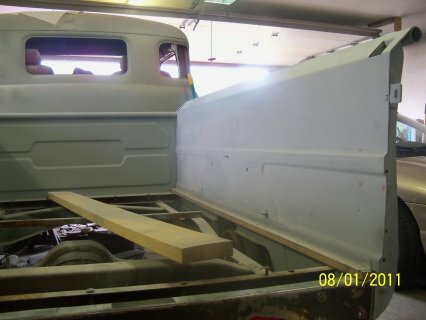 Do your practice painting on the Dakota with the same brand and type of paint you plan to use on your good truck. All brands and types of paint within those brands spray differently. Use your practice time to acclimate yourself to how the paint for your good truck prefers to be sprayed. As far as prepping the Dakota, wax and grease removal before you start the initial sanding so you don't grind that stuff into it and a good bath (do not use car wash soaps at this point- most contain waxes), use blocks for sanding, longer blocks for flatter areas, x patterns, long strokes. I use a powdered guide coat for dry sanding and the spray guide coat for wet sanding. Used to have one of those ratcheting screwdrivers years ago as well as some of those Chrom-vanadium wrenches. The wrenches I think were soid in stores like Coast to Coast or maybe Western Auto types, In later years, I kept them in the toolboxes on farm equipment for field repairs or maintenance while the Macs, Snap-ons stayed in the shop. Had one of those really thin pliers (top pair) too, hardly ever used it, uncomfortable in the hand. Given the choice of owning either, I'd take the old one, hands down. The D50 does absolutely nothing for me. Take a good look at the center section near the front of the wing pivots. They can tend to crack at that point and once the bolts have been removed, there is little to stabilize the dimension between the front panel and the cowl. You'll want to store those pieces in a manner that doesn't stress the center section. I doubt Rock auto manufactured the part themselves, actual manufacturer probably supplying any number of vendors, including the popular parts house suppliers. Unfortunately, the quality of wheel cylinders is a much too frequent topic. I'm hoping the new cylinders I bought for a 20 year newer project are OK. The Dakota may have had an impact/rollover fuel pump shutoff wired into the system. I'd sure incorporate it if it's still available.. Will the pump still operate efficiently running power through the resister? On your initial disassembly, do you recall any unusual wear patterns on the old bearings? Are you trying this with or without the rear main seal installed? Rope seals can put a lot of drag on a crank and the closer to the seal you get the more likely to get that drag and maybe a lockup. If you have them in, take them out and try again. Check the backside of all the bearing shells. They should all have the same thousandths markings. Those notches in the block and main caps were put there by the factory. There're used to keep the bearing shell from rotating and caps, when installed will have that notch on the same side of the block as the one in the block. Looks like you need to get the rain gutter finished up so you have a solid reference line to trim to. Drivers door fit the same way? Has anybody tall thinned out their seatback? My firewall Is set back quite a bit as well. While I have buckets mounted, my most comfortable position was by actually moving the entire seat forward and then leaning it back. When I had the seat shoved back as far as it would go, the seating position was too upright and felt like I was folded up. Moving forward and leaned back relaxed the knees and legs. Since you have a standard height cab, you should be able to go up a bit and lean it back at the same time. What you may be looking for may be called ribbon webbing by an auto upholstery supplier or someone who does marine covers. I've got a bunch of it in 1", 1 1/2", 2 " that came with the used sewing machine purchased several years ago from a upholsterer who did a ;lot of boat covers before he retired. If you can't find anything, let me know and I'll send you some. I got a chance to see it at last year's btt50's. I'd seen it in pieces and finally got to see it all together. that place is huge and my son, his wife and I spent the entire day Saturday keeping a lookout for it, finally found it as we were heading out to go home walking on one of the outer perimeter streets. Looks really good and sounds as good as it looks. Excellent truck to use as reference for a restoration or inspiration to go forward on your own project. I guess I didn't understand what you meant by "island'". I interpreted it as glass itself because the rear section of glass seems to be somewhat smeared. Do you mean the area around the glass that's now black? If so, DupliColor makes a peel off paint that you can experiment with. I believe it becomes permanent after a certain number of days. My apologies if I've offended you in this series of posts.